Excilone is committed to propose to its customers innovative products and a know-how acquired on an unique experience of more than 15 years of his different employees. 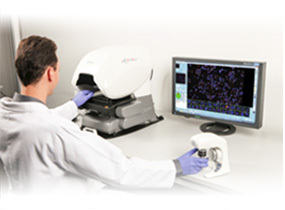 We propose you solutions of automation for the preparation of samples for cytogenetics, but also solutions of imaging. The automation in this domain does not answer necessarily the management of a significant number of samples to be handled, but especially in the standardization of the latter and in their traceability. Today the initiatives of accreditation and standardization request a perfect controlled process of all the steps. For the laboratories of Pathological Anatomy and Histology, we reflect ceaselessly to give users, the innovative and really forward-looking solutions of the discipline. Excilone offers you a unique solution to prepare your biological samples, to scan them and share them, to exchange them, and to analyze them by cell imaging or the molecular content description. Because today, it is essential to analyze the molecular contents of smaller and smaller tissue samples, we open the way of the nanogenomics and the microgenomics with totally integrated solutions, which authorize you to reach the scale of a unique cell. Because we think that the future gets ready from today, we try hard to propose the most innovative solutions in the domain. Our solutions of instrumentation request a great technical expertise, and to give to each of you the opportunity to take advantage of it, we also develop solutions of services, allowing you a full efficiency in your research activity and a strict control of your costs.